Want to have a fun night with your friends? 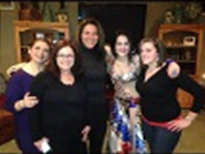 Host or attend a Belly Dance Happy Hour! 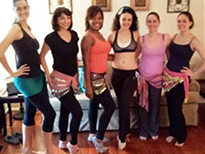 Don’t have time to make it to a weekly bellydance class? A Bellydance Happy Hour is the perfect solution! Host a Happy Hour in Your Home on Monthly Basis and Take Advantage of the Following Perks for You and Your Guests! This is for those ladies that always bring the party to their house. Host a Happy Hour and get 10 of your girlfriends to sign up for the On the Rocks package and you don’t have to pay full price for your swag. You’ll get your hipscarf and a Shimmies on the Rocks T-shirts for a steal! Plus your lesson is free! You are the Diva that will not be outdone. You Host a Happy Hour and get 20 of your girlfriends sign up for the On the Rocks package and you have to pay even less for your swag. 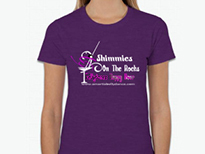 You’ll get your hipscarf and a Shimmies on the Rocks T-shirt for a steal! Plus your lesson is free!